From end-of-year field days to classroom usage, name tags are found all over schools! Whether it’s a teacher’s ID or “My Name Is…” stickers, there are so many ways to use name tags in schools. 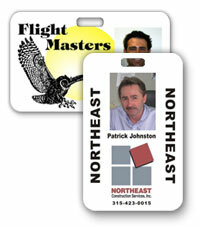 Here are a few ideas from our plethora of personal identification products to get you started. One of the essential features of a photo ID badge is the security it offers. Provide these for teachers and other school staff to ensure that the proper people are entering and exiting your building. Quickly and easily identify someone with photos and provide safety and security while at school. They will also help with productivity. Teachers can focus on what they need to teach instead of worrying about other security issues. Pictures of an individual are on each tag, along with their name and title, to make recognition easier. With a quick glance, anyone can see who that person is and make sure they belong where they are. With as many choices as we have for these name badges, we’re sure to have what you’re looking for! 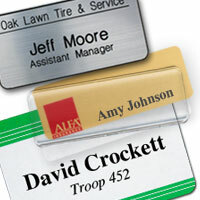 Use adhesive name badges for the new students as name tags on their desks to make them feel welcome. Customize a Mighty Badge for each of the hall monitors. Or use a name badge as your hall pass. With magnetic fasteners, it will be easy just to have the student attach the badge to their shirt, and you’ll never lose another hall pass. And, don’t underestimate badge holders. While they aren’t quite in this product category, they are instrumental in schools. This simple way of displaying credentials is as convenient as they come. The lightweight vinyl allows for everything to be seen through them. You can add pictures, schedules, names and so much more. Use them for students, teacher and visitors. Whether it’s hundreds or thousands, it doesn’t matter how many kids are coming back to your school this year. Security is always an issue. Yes, there are name tags and photo ID badges for the teachers. But how do the children keep their things safe and secure? Lanyards are a convenient way of displaying identification and other things while at school. And these lanyards don’t have to be boring. Choose from a variety of colors to match your school and mascot! These lanyards are also perfect for fundraising events, sporting meets, and any other time your school gets together. 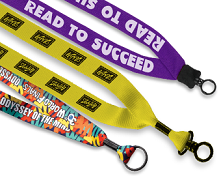 Help your students stand out from the rest with bright colors, logos and messages custom imprinted on these lanyards. And, come check out all of our other products that will help in your school!